YOU ARE THE POLLUTION SOLUTION! Here are just some of the ways that you can help bring cleaner water faster to all of Richmond. 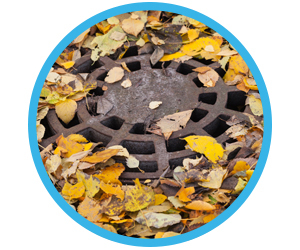 Autumn leaves may be beautiful, but when they’re swept into catch basins, they can also be a major cause of pollution and flooding. Do your part to limit the leaves that ride with the rain by composting or bagging them in proper containers for curbside pick-up. Take a look at the curbs and gutters near your home. Every type of litter or debris you see nearby can clog up storm drains, causing unnecessary flooding and pollution. Never put any kind of trash in a storm drain. Dispose of your litter responsibly, and make sure your trash and recycle bins are always closed firmly. Also, wash your car on the grass, not a hard surface, or take your car to a carwash where they recycle the water. Fertilize in the Fall. That’s All. Fertilizers applied on land can runoff directly into Richmond waterways. Too much fertilizer results in too much algae in the water, which can deplete the oxygen fish need to survive. Have your soil tested to know the right amount and type of fertilizer for your soil, and do your part to reduce the amount of fertilizers and pesticides used on your lawn. 15% of all bacteria in our water comes from pet waste – bacteria that can carry harmful disease. Pet waste left behind in yards, streets, driveways and parks is NOT fertilizer – without proper treatment, it’s just bacteria. And that bacteria can end up in our waterways. Household hazardous waste (HHW) is any material that can harm our environment when not handled properly. Common HHW includes pesticides, cleaners, paints and even electrical devices. Help reduce HHW by checking warning labels before you buy and disposing of HHW products properly. The East Richmond Road Convenience Center, 3800 E. Richmond Rd., accepts household hazardous waste from 7:00 a.m. to 3:30 p.m. weekdays. Our wastewater treatment plant can do a lot of amazing things to improve Richmond’s water quality – but one thing it can’t do is remove or process the many compounds found in medications. And when medicine is flushed down the drain or put in our landfills, those drugs can end up in our water. For more information on properly disposing of medicine, visit DPU's page or this FDA guide. Drug take-back programs are the safest way to dispose of prescription drugs. To see take-back locations throughout Virginia, please visit the Attorney General of Virginia's website. Keep F.O.G. – fats, oils and grease – out of the drain! When fats, oils and grease go down the drain, they can cause costly clogs, sewer overflows and health hazards, too. Keep your drains clear by canning used cooking grease, scraping leftover food into the trash and using a drain basket to catch food scraps in the sink. Tap water vs. bottled water? It’s no contest! Using tap water instead of bottled water can help protect the environment – and your monthly budget! Whether you’re heading to the gym, the park or just a day in the office, a reusable, refillable water bottle is what you need to stay hydrated. Plus, an estimated 22 billion water bottles land in our nation’s landfills each and every year. And since plastics are not biodegradable, those bottles will be around for quite awhile. Make sure your drains are kept clear and unclogged. Make plans to replace any old plumbing and install certified lead-free fixtures. Drain and flush your hot water heater annually. Always keep hazardous chemicals and unsanitary materials away from drinking water faucets. 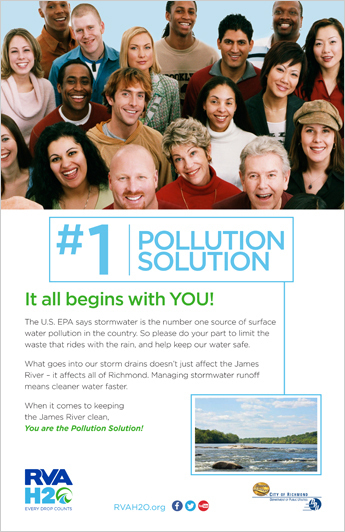 Download your “Pollution Solution” posters! Here’s a great way to remind yourself and those around you that the solution to pollution begins with the actions we take every day. 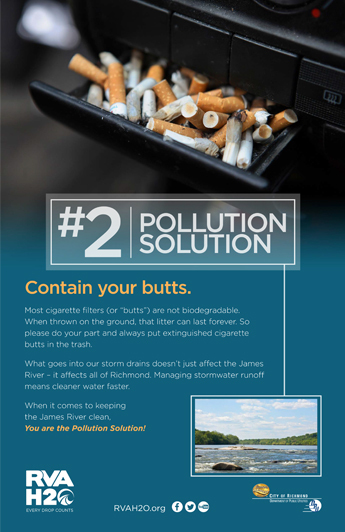 “The Pollution Solution” is a series of posters that focus on how we can help bring cleaner water faster to all of Richmond. Perfect for classrooms, workplaces and even your refrigerator, “The Pollution Solution” is what happens when small actions lead to big changes.